Arriving at Zion NP the afternoon before had been a breathtaking event. Chelsea had warned us of its beauty, but the canyon is truly a sight you need to behold with your own eyes to appreciate. We wound down the mountain from the Southeast entrance, taking in as many views as possible without driving straight off the road. We passed through a tunnel and held our breath like good adventurers are supposed to do. We attempted to do the same at the next tunnel, but when we nearly passed out we decided it was best to cut our losses. For your future endevors, know that a 1.1 mile long tunnel is not the best place for the breath holding game. We managed to snag one of the few remaining First Come First Serve campsites (South Campground), checked out the nearby Visitor’s Center for our customary swag, and settled down with a hot dinner courtesy of my new backpacking stove. Then off to bed for another night in the tent. Ranger Carolyn had warned us the previous day against hiking the Narrows due to a high chance of flash floods (we later learned that there indeed had been a flood on this day). She could tell we were pretty extreme ladies and recommended the Observation Point hike. 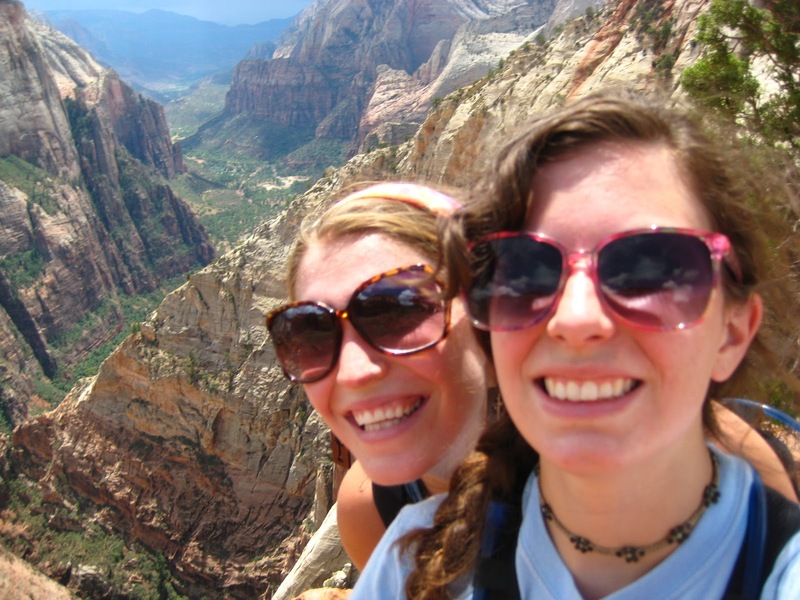 This 8 mile hiked gained 2,148 feet to a viewpoint of Zion Canyon. We were up and scurrying around the campsite before the sun peeked over the canyon walls. With a hot breakfast in our bellies, we gathered the supplies we’d need to fill our day packs. Snacks. Lots of water. First Aid Kit. Rain gear. Hats. Sunscreen. Headlamps. Multi-tool. Binoculars. Phones (in a plastic baggie). Cameras. Maps. Rain. We might have been ready to head out on our hike, but apparently nature wasn’t ready for us. We managed to stow our packs in the car, grab our letter writing box and hide in the tent while we waited out the rain. A few postcards later, the rains let up and we quickly grabbed our packs and headed towards the visitor center before the sky changed its mind. 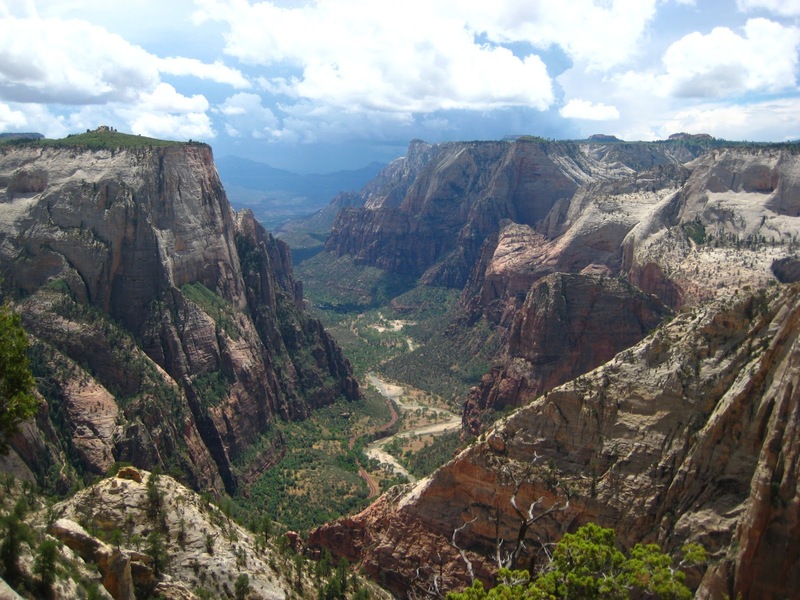 Zion NP is uniquely in that it is primarily car-free park. We were able to leave our car at the campsite and walk a short jaunt to the nearby shuttle stop, where we immediately hopped on a shuttle. The ride was accented by an audio tour that points out major formations along the route in addition to detailing each stop. We rode our shuttle to the very top to catch the whole speal before heading back to our desired stop at Weeping Rock. Hiking a narrow part of the trail. After taking in a few informational signs, we were hiking and ascending towards Observation Point. We hike and climb. We climb and hike. We sweat and walk. We later agreed that had someone pointed out to us the ending location of our hike it would have been much more daunting. However, since we were blissfully unaware of the realities of our situation, the day went by quickly. We cheerfully greet people as they pass us. The normal hiking pleasantries, “Hey there, How’s it going?, See ya at the top, Holy crap, sir, is it much further?”. We enjoy talking to strangers. Most smiled and replied in kind. It must be noted that every single stretch of this trail offered a wonderful view. We twisted in and out of different areas along the canyon walls. Sometime overlooking the Virgin River. Sometimes in narrow canyons. Sometimes with a view of pine trees. We took a birage of photos along the way, each time completely certain that the image captured couldn’t possibly be topped by another. When we were thinking that we simply couldn’t go on much further, a lovely couple encouraged us with the reassurancet that we were only a few switchbacks from the top and then the trail would level out among the trees. We scrambled to the top and bathed in the shade of the Ponderosa Pines. Only a tiny bit further. Now that’s a view. Even with clouds rolling in with some light rain on the far side of the canyon, this was still a spectacular vantage point overlooking Zion Canyon. The other hikers seemed just as pleased with the visual reward and lounged around, looking victorious. We were quickly welcomed into the elite ranks of successful summiteers. People are much more willing to chat with you when they are rested and enjoying the fruits of their labors. We took photos for other groups and they returned the favor for us. I believe everyone would have been content to stay at the top of the canyon wall for the better portion of the afternoon. The clouds were creeping closer, and even though we were on the highest of high ground, we still felt the need to get back to our campsite. Bidding farwell and exchanging some campsite numbers with our new friends, we scampered down the trail much faster than the climb. Happy faces at the top! Safe and sound at the campsite, we once more began to forage. We were quite proud of our afternoon feat and felt deserving of an appropriately delicious treat. Before leaving for our journey, we’d stocked up on food and snacks, but one stood above the rest. They are the perfect candy. My favorite. I love eating them one color at a time. Letting them sit in my mouth until the candy coating melts (in the rightful place) them enjoying the chocolately center. Rattling the bag to make sure I’ve captured all the yellow ones before moving on to green. We pull the unopened bag from our cooler. A fresh chill treat. I pull back the plastic tab to reveal the resealable zipper. XXL 56 ounce bags don’t mess around. I pull open the bag. Now there is really only one reason I would go through the trouble of taking you through this giant lead up. Something bad has happened. Something tragic. A disaster of fierce proportions. Only a wet, brown desicration remained. You can imagine my heartbreaking disappointment. My new favorite candy is now goldfish crackers. That is all I have to say about that. I decided to make a glorious dinner to raise our spirits and set off into town in search of an onion. So many grand meals start with an onion. I decided on the camping stove version of the meal Chelsea had prepared for us. When I got back to good ol’ campsite 34 I was greeted by Rachel and two of our new friends from Observarion point. B and Br had decided to take us up on our dinner enticements and came bearing gifts of cheese, ramen, and a slackline. My dinner didn’t call for their provided ingredients, but Rachel’s enthusiasm over the slackline was immense. She’s now hooked and wants her own to perfect her skills. After enjoying some after dinner refreshments, we chatted, we wandered about, we discussed the finer points of being a trail creeper (hint: it involved popping out from behind bushes and aggressively inquiring whether the unsuspecting hiker is a part of a very popular social networking site). The night wound down, as did we, and the first few stars began to visualize. Rachel gets excited if there are more than 4 stars out and tried to point out what she could. Br somehow manage to manifest a purple laser pointer that could be used to point out stars. But it was not quite dark enough. Our new friends eventually had to return to their own campsite, but gifted the laser pointer to us (they had two) so that Rachel could fulfill her new found desire to point at things in the sky. We will have to pass it on eventually and keep the camping karma going by meeting more friends and bestowing something of ours onto them. 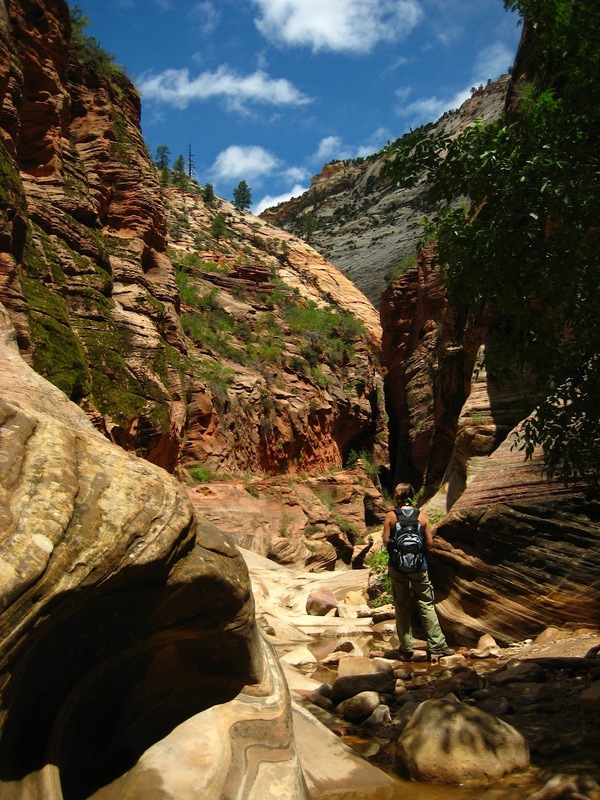 Zion friends, if B managed to remember the website and you come check out our blog, shoot us an email with your details at alwaysscientist@gmail.com. If you include your addresses we’ll send you postcards! Have you ever made friends when talking to strangers on an adventure? We had planned on it, but the conditions were slippery. I don't know if I could've handled that. The rangers suggested we do this hike as an alternative.